Snapple: Finally, Made From the Best Stuff on Earth? Snapple: made from the best stuff on earth? To keep this slogan true, the Snapple brand is in need of some serious ingredient-detox, recipe renewal and brand plastic surgery. Snapple. It's one of those brands that I used to adore. An cold bottle of Snapple Peach Iced Tea in my hand after tennis practice, and I was a happy girl. But then I began to question the ingredients, including the high amount of the controversial sweetener high fructose corn syrup. I slowly dropped the brand as a fave. My days of Lemon Iced Tea and Snapple Apple were over. Until now. 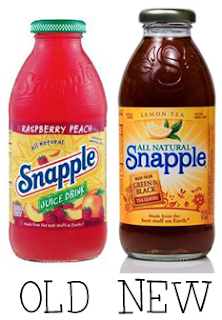 There are a few very exciting updates that Snapple will be making to their brand and recipes. "Snapple, once the “official beverage of New York City,” is being redesigned — inside and out — this year. The popular iced teas are losing the high-fructose corn syrup and the dated font. The bottles are becoming more svelte (to better fit into cup holders, which became a force after Snapple iced teas were originally introduced). The labels will also emphasize the green and black tea leaves used to make the drink. The changes are rolling out over the first few months of the year, and they are expected to hit New York in early March, according to Dr Pepper Snapple Group, which is now the owner of the brand." I'm excited to see and taste the new SNAPPLE.